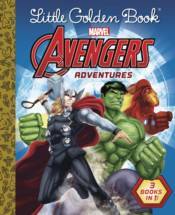 Marvel fans will love seeing their favorite Super Heroes Little Golden Books! Marvel Super Heroes are some of the most popular comic book characters in the world, and include: Spider-Man, the Hulk, Iron Man, Captain America, Thor, and the Avengers. This book's art features a style that is both classic comic book and classic Little Golden Book, making it a must-have for kids and collectors! Three new Marvel theatrical movies in 2018 will keep awareness high: Black Panther, Avengers: Infinity War, and Ant-Man and the Wasp!